Rome is at the centre of world architecture and classical design and it was here that structures such as the arch, the vault and the dome were established. The city is a treasure trove of different architectural styles including Classical, Imperial Roman and Fascist. 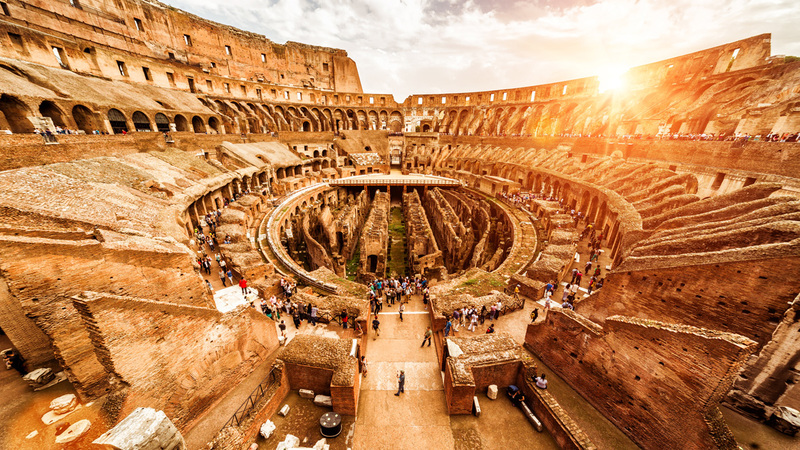 The Colosseum is one of Rome’s most famous landmarks. This iconic site is visited by more than 6 million tourists each year. Its huge gladiatorial arena is encircled by outer walls, which have three levels of columns and arches. It dates back to AD 80 and had room for more than 50,000 spectators who would watch displays of exotic animals, gladiator fights, public executions, recreations of battles and other spectacles. It was the Roman Empire’s centre of entertainment for over 500 years. It is no surprise that it was named as one of the Seven Wonders of the Modern World in 2007. It is open daily. The Circus Maximus was constructed in the 6th century BC as a chariot racetrack, which was also used for games and gladiatorial combat. In its heyday it would have had room for at least 150,000 spectators in a structure measuring 620 x 140 metres. It had obelisks placed as a barrier in the centre of the track and laps were marked by ornamental eggs and dolphins. These days, little remains of the structure itself, but it is an attractive open green space, which is popular with locals. This is the only remaining example of a Roman pyramid. It is 36 metres high, constructed of brick and cement, with a façade of white marble, and was built between 18 and 12 BC as a mausoleum for a wealthy Roman. It rises at a steeper angle than the Egyptian pyramids. One of the best vantage points is from the Protestant Cemetery inside the Aurelian walls. 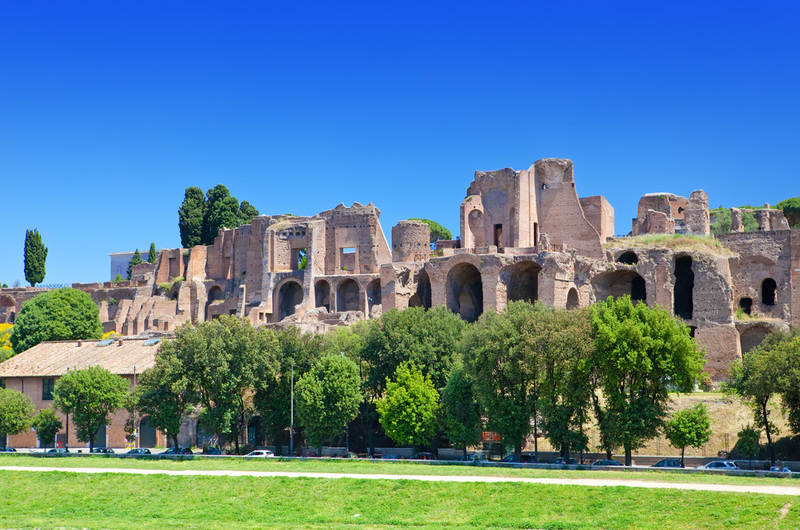 This impressive thermal bathhouse complex was one of ancient Rome’s largest at 214 by 114 metres, built on four levels, two of which were below the ground. It had an effective water supply and drainage system. It also had its own heating system which heated the water, as well as the floors and walls of the baths, by means of wood-fired ovens, tended by slaves. It fulfilled many functions in ancient Rome, not only as a bath, sports and health facility but also as a place to socialise and relax. 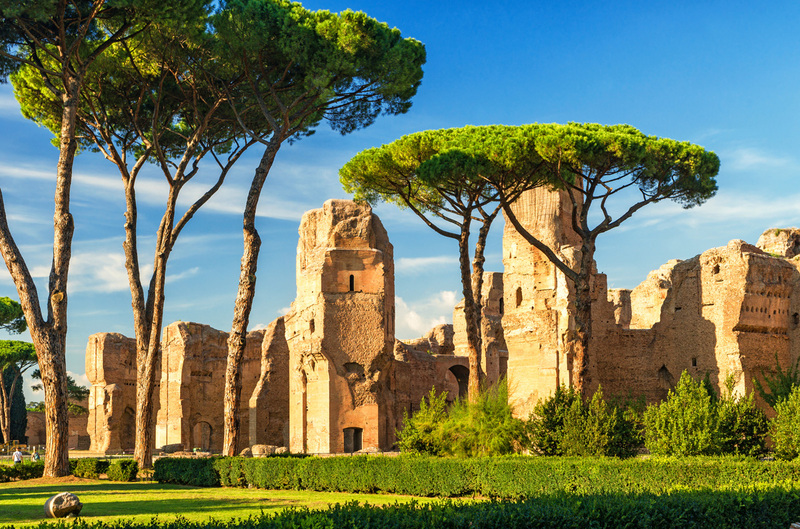 These magnificent public squares, known as the Imperial Forums, symbolised the authority of the Roman Emperors, built to demonstrate their power and riches. They are set along the main street of Via dei Fori Imperiali. The first was built by Julius Caesar in 46 BC and then by subsequent Emperors: Trajan, Augustus and Nerva, during the period up until 113 AD. Walking through these grand squares feels like taking a step back in time through the history of ancient Rome itself.